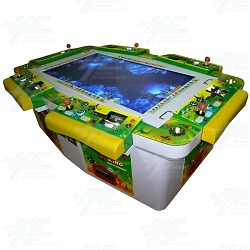 58" Screen Now Available in Ocean King, King of Treasures & Fish Hunter Plus - No Charge! The Ocean King, King of Treasures, and Fish Hunter Plus machines are now being upgraded with a 58" Screen Display and at no extra cost for customers! This means that when you buy an one of the machines mentioned above, you can now get it with a 58" monitor for the same price as the 55" model! The best part is, this does not affect the actual foot print of the machine; the dimensions of the cabinet will remain the same, but the screen will be bigger. Bigger and better visuals without compromising the size or the price of the machine. If you are looking at buying one of the highly sought after machines from the Ocean King series, consider the size of your location and grab the 58" to improve the quality of experience for your customers. These popular machines draw crowds over in every location, and have been a smash hit on the redemption and gaming scenes. Having a bigger screen and more for players to look at can only increase this popularity. If you would like to know more about these products, simply click on the links, and to inquire about a 58" model Ocean King, King of Treasures, or Fish Hunter Plus machine, you can contact our sales staff here.